Giessdorf® is a registered trade name of Zoe Industries, Inc.
Customers asked for it, and we built it. 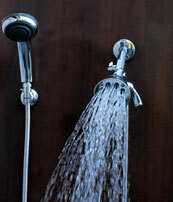 Now you can have the popular Giessdorf brass shower head with handheld. Giessdorf 8 jet Brass Giessdorf shower heads are manufactured with 3 Pounds of Solid Brass. Available with our hand held shower bracket or 24 inch Solid Brass Shower Bar. The most powerful shower head you've ever used. 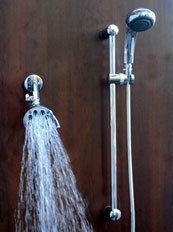 Many of our customers say this brass shower head with handheld is "the best shower I've ever had!"